A beautiful lawn is easier than you think! Toss the trimmers and forgo the fertilizer! TigerTurf Marquee Pro Natural will blend in with your natural surroundings perfectly! Marquee Pro Natural turf is a top choice among certified landscape contractors and, similar to the Marquee Natural turf, it has a unique blend of ⅔ field green and ⅓ lime green grass blade colors to create an amazingly natural look! 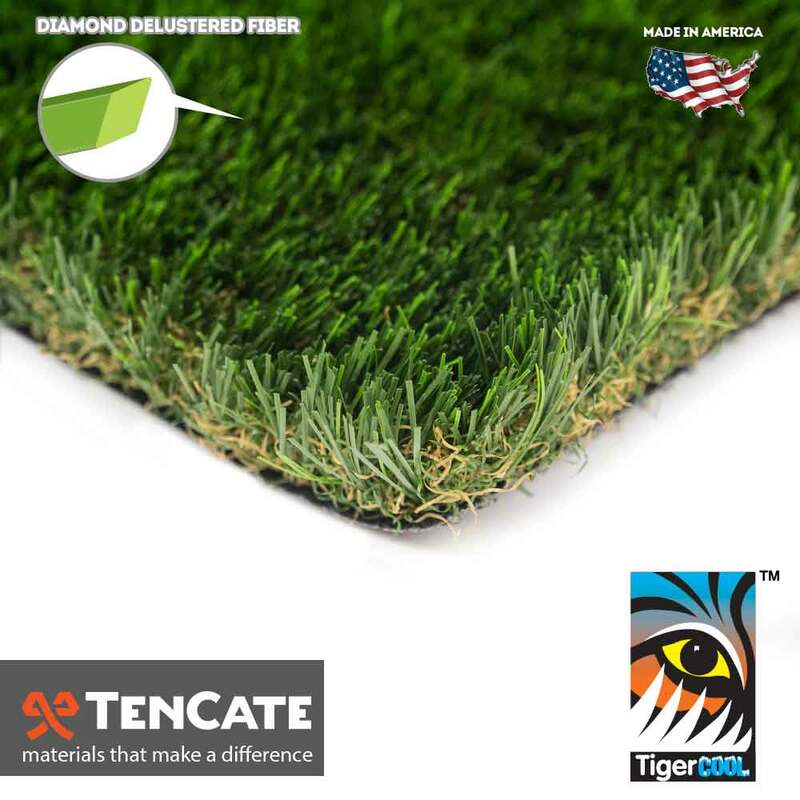 This synthetic grass features a polyethylene diamond delustered grass blade shape as well as a slender blade width for an incredibly soft feel! Not only is Marquee Pro Natural ideal for a plush landscape, it is also extremely durable. Each grass blade is triple reinforced into the backing through tuft bind technology. This technology makes Marquee Pro Natural synthetic grass incredibly resistant to pull force and ideal for high traffic areas. In addition to a strong yet soft synthetic turf, Marquee Pro Natural also features U.V. inhibitors as well as our premier TigerCool technology applied during the manufacturing process. This turf will never fade and keep a cooler surface temperature! Guaranteed by our 15 year warranty, Marquee Pro Natural synthetic grass is a one-of-a-kind turf that is sure to remain your preferred landscape product for years to come! Keep your lawns, commercial parks and dog runs green with Marquee Pro Natural artificial turf!